How to Make a Didgeridoo. Have you ever thought about making your own didgeridoo? 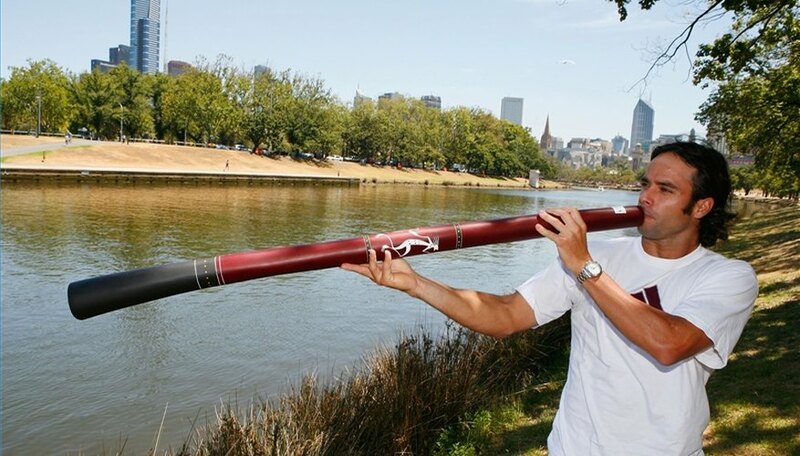 Didgeridoos are traditional Australian musical instruments that have a very unique sound akin to a low humming or buzzing sound. However, authentic didgeridoos are hard to come by, and are also quite expensive. Learn how to make your very own didgeridoo, and save yourself a lot of money. Go to a hardware-type store and buy a 2 1/2-inch thick PVC pipe cut to at least 3 feet, or longer if you'd like. Pick up some sandpaper - medium-grade and fine-grade - as well as a can of spray primer paint. Go to an arts and crafts store and buy some colorful acrylic paint, and some medium-sized and small paint brushes. Go to a natural foods store and buy some beeswax. Sand the PVC pipe's body lightly with medium-grade sandpaper. Sand and round the pipe's ends first with the medium-grade sandpaper and then with the fine-grade sandpaper. Wipe the dust off the pipe with a slightly damp cloth before you paint it. Read the instructions on the spray can of primer paint. Follow the instructions carefully. Prime the entire pipe with the spray can of primer paint. Let dry. Paint the pipe to decorate it using any colors, styles, and designs you choose. Choose a pattern or design and paint carefully and precisely. Let dry. Spray a couple coats of clear acrylic over the body of the pipe to prevent the paint from peeling. Let dry. Melt the beeswax using a double boiler or something similar. Take a small object like a butter knife to dip into the wax. Build up a waxed surface around the edges of the end of the pipe you have chosen as the mouthpiece. Use your fingers to shape it and round it. Allow the wax to cool and harden after you are satisfied with the shape. Make sure you give enough time for the pipe to dry after priming it and painting it before moving on to the next step. When melting the beeswax, it's best if you don't heat it directly - it will melt much more nicely that way.